I love a good medieval story. It always strikes me that about how different it is concerning the rules for women compared to regency times. I found that the book jumped around a little bit. We start with Edmund with King Richard, and after everything goes black (and things look pretty dire for him) he all of a sudden is home and free to start his life. It's all explained in the book, but I do feel we were just sort of left hanging there. I was entertained the entire book. I found the characters to be well written and the story to progress at a great pace, not to mention it was just a good story to be told. It was a pretty easy fast read and I can see myself reading it over again and again. First off, how gorgeous is the dress on the cover of this book? I love that shade of blue, and the cut and fit of the dress. I would totally wear that! Now to the story. 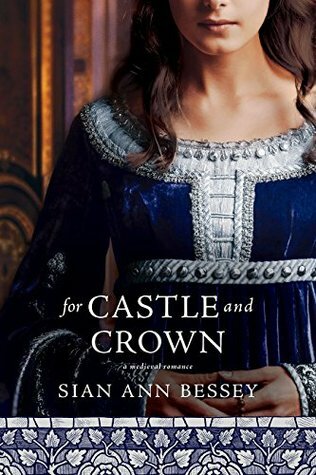 I have enjoyed Sian's other books that I've read, and I enjoyed this one too, but it did start out a little too slow for me. It seemed like it took a whole lot of time for things to start happening. Once they did though, I couldn't put the book down! I'm not admitting to anything, but I may or may not have been late to things a time or two because I needed to read "just one more page!" My heart ached for Pippa and the horror she went through. It was especially sad that she felt the need to hide herself away, thinking she would no longer be welcome at the castle. Even though they had been separated for a few years, Edmund and Pippa's friendship seemed like it started up right where it left off. I think the most heartwarming part of the book was when Edmund went to talk to Pippa after he found out where she was.